If you would like to see Slowly Rotating Jupiter rotating, click below. This entry was originally posted at https://nanila.dreamwidth.org/1192954.html. The titration count is at .0 pKa. That Jupiter is awesome. I need to get one too now. 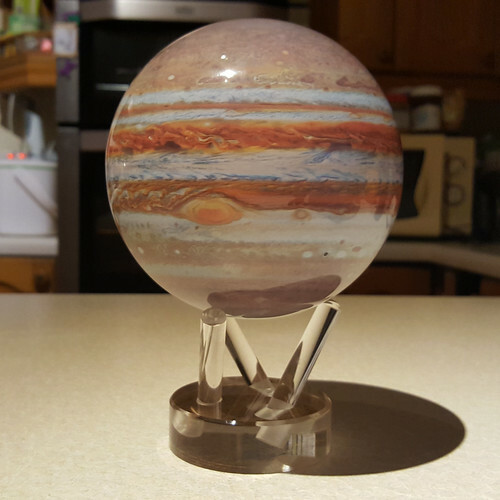 Your slowly rotating Jupiter is AWESOME! Also, yay for potty training being back on track. Fingers crossed! Plushie Jupiter is adorable. The red spot nose...! I have one as well. You get one guess who sent me that. Keiki is a little bit in love with it. He arranges plushie Rosetta so it's cuddling plushie Jupiter. He arranges plushie Rosetta so it's cuddling plushie Jupiter. The children discovered it this morning. They were mesmerised! Wow - I absolutely love slowly rotating Jupiter! WTF on the slowly rotating Jupiter. That is the most satisfying gadget I have seen in some time. I could watch the video for a long time. I can't imagine how mesmerizing it must be in person. It's riveting. And so soothing. It's solar-powered. I *think* the cell is located under the northern polar region, as there is a lot less detail there than I'd expect from the available imaging of the planet.